If you are completing this process in-person, your counselor will ask you questions about your budget, assets, creditors, and factors that led you to consider bankruptcy. 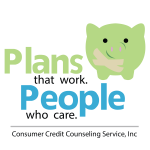 After reviewing all your information, your counselor will conduct an analysis of your financial situation and explore your options with you and develop an individualized action plan for dealing with them. If you complete this counseling in person your counselor will provide you copies of all this information during your appointment. Click here to submit your budget online for in-person counseling. To help cover the cost of providing this session to you, this agency charges a fee. The cost is $50 for in-person counseling, regardless if you file single or jointly, payable by debit/paypal. The fee may be waived based on your lack of ability to pay. A waived fee is based on 150% of poverty guidelines updated periodically by the US Department of Health and Human Services. If you think you qualify for a waiver please call 316-265-2000 or Contact Us. The fee amounts include any fees associated with generation of the certificate.